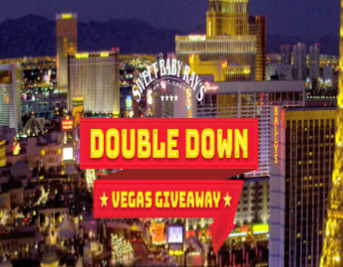 Sweet Bay Ray’s Double Down Vegas Sweepstakes – Win a trip to Las Vegas! Win a trip to Las Vegas! ENTER SWEEPSTAKES HERE – Sweet Baby Ray’s Sweepstakes page. ENTRY LIMIT – One Online Entry per person during the Sweepstakes Period. ELIGIBILITY – The Sweepstakes is open to legal residents of the 48 contiguous United States, and the District of Columbia, who are age 21 or older at the time of entry. SWEEPSTAKES ENTRY PERIOD – The Double Down Vegas Sweepstakes begins at 12:00:01 AM Eastern Time (“ET”) on Wednesday, January 23, 2019 and ends at 11:59:59 PM ET on Wednesday, March 6, 2019. – Four (4) days / three (3) nights hotel accommodations at a hotel determined by Sponsor based on single room/double occupancy. The ARV of Grand Prize: $2,500. March 11, 2019), send a stamped, self-addressed envelope (no later than April 8, 2019), to: The Double Down Vegas Sweepstakes Winner Confirmation Request, PO Box 25466, Rochester, NY 14625-0466. The Ultimate HomeGate Sweepstakes – Win a 60 inch TV & more! Win a 60 inch TV, a Weber grill & more! 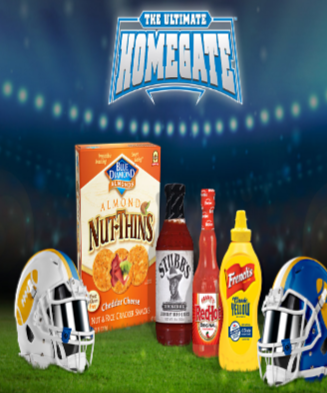 ENTER SWEEPSTAKES HERE – Ultimate Homegate Sweepstakes page. ENTRY LIMIT – LIMIT: one (1) entry per per person per email address over the Sweepstakes Period. ELIGIBILITY – This Sweepstakes is open to legal residents of the 50 United States and the District of Columbia who are eighteen (18) years of age or older (OR THE AGE OF MAJORITY IN YOUR STATE OF RESIDENCE, WHICHEVER IS OLDER), at the time of entry. SWEEPSTAKES ENTRY PERIOD – The Ultimate HomeGate Sweepstakes (the “Sweepstakes”) begins Friday, September 14, 2018 at 12:00:01 a.m. (midnight) Eastern Daylight Time (“EDT”) and ends Sunday, October 28, 2018 at 11:59:59 p.m. EDT. One (1) 60” Big Screen TV. ARV $800. Brand and model to be determined by the Sponsor at its sole discretion. One (1) $100 Fanatics® Gift Card. ARV $100. Terms and conditions of the gift card apply. Total ARV of this prize package $1,600. WINNER’S LIST – To obtain the names of the winners (available after 11/16/18 send a self-addressed stamped envelope to: The Ultimate HomeGate Sweepstakes Winners, P.O. Box 2312, Framingham, MA 01703-2312. All such requests must be received by 11/23/18. 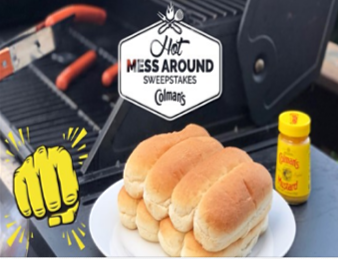 Colman’s Mustard “Hot Mess Around” Sweepstakes – Win $2,500 & more! Win $2,500, a grill & more! ENTER SWEEPSTAKES HERE – Colman’s Mustard Sweepstakes page. ELIGIBILITY – Colman’s Mustard “Hot Mess Around” (“Sweepstakes”) is open only to legal residents of the 50 United States and D.C. 18 years of age or older as of August 15, 2018. SWEEPSTAKES ENTRY PERIOD – Enter, between 3:00 pm Eastern Standard Time (“EST”) on August 15, 2018 and 2:59 pm EST on October 10, 2018. WINNER’S LIST – For the name of the Grand Prize winner, send a stamped, self-addressed envelope to: “Hot Mess Around Sweepstakes” Prize Center, C/O Rinck Advertising, 113 Lisbon Street, Lewiston, Maine 04240. Please indicate the Giveaway as “Hot Mess Around Sweepstakes”. Requests received after November 26, 2018 will not be honored. 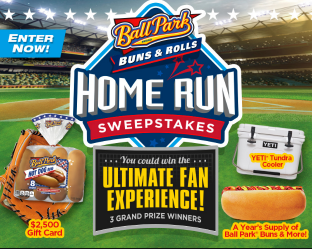 Ball Park® Buns Home Run Sweepstakes – Win $2,500 Visa gift card & more! Win a $2,500 Visa gift card & more! ENTER SWEEPSTAKES HERE – Ball Park Buns Sweepstakes page. ENTRY LIMIT – Limit one (1) Entry per person using only one (1) e-mail address per day. ELIGIBILITY – Sweepstakes is open to legal residents of the fifty (50) United States and the District of Columbia, eighteen (18) years of age or older (except in the case of legal residents of certain states where the legal age of majority is greater than eighteen (18) years of age, such legal age of majority) as of date of entry. SWEEPSTAKES ENTRY PERIOD – The Ball Park® Buns Home Run Sweepstakes starts on July 2, 2018, at 12:00 a.m. Eastern Time (“ET”) and ends on July 29, 2018, at 11:59 p.m. ET. PRIZES – GRAND PRIZES – Three (3) Grand Prizes will be awarded: The Grand Prize winner will receive one (1) $2,500 Visa gift card, one (1) authentic baseball jersey of winners choice, one (1) Yeti Tundra 35 cooler, and a one (1) year supply of Ball Park® Buns, awarded in the form of fifty-two (52) Ball Park® Buns coupons, each redeemable for a package of Ball Park® Buns up to $4.00 in value (each, a “Grand Prize”). The Approximate Retail Value (“ARV”) of each Grand Prize package: $3,308.00. ENTRY PERIOD PRIZES – Four (4) Entry Period Prizes will be awarded (i.e., one (1) awarded per Entry Period): Each Entry Period Prize winner will receive one (1) replica baseball jersey, one (1) Yeti Roadie 20 cooler, $40 worth of Ball Park® Buns and awarded in the form of ten (10) Ball Park® Buns coupons, each redeemable for a package of Ball Park® Buns up to $4.00 in value, and a Coleman tailgating portable grill (each, an “Entry Period Prize”). The ARV of each Entry Period Prize package: $494.00. WINNER’S LIST – For the names of the winners (available after August 20, 2018) send a self-addressed, stamped, envelope by September 20, 2018, to: Ball Park® Buns Home Run Sweepstakes Winners, 255 Business Center Drive, Horsham, PA 19044. 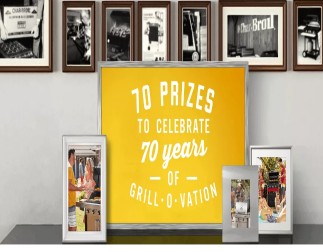 Char-Broil 70th Anniversary Sweepstakes – Win a $500 Visa gift card! Win a $500 Visa gift card or some great grilling prizes! ENTER SWEEPSTAKES HERE – Char-Broil Sweepstakes page. ENTRY LIMIT – One Entry is allowed per person. ELIGIBILITY – The Sweepstakes is only open to legal residents of and located in the 48 contiguous states of the continental United States that are at least 21 years of age or older at the beginning of the Entry Period. SWEEPSTAKES ENTRY PERIOD – The Sweepstakes entry period begins at 12:01 AM (Eastern Time) on July 1, 2018 and ends at 11:59 PM (Eastern Time) on July 31, 2018. 10. twenty (20) “topper & pan” prize packages which is comprised of one (1) Grill+ Deep Dish and Cutting Board (ARV $34.99), one (1) Grill+ Topper (ARV $19.99) and one Grill+ Pan (ARV $11.99). WINNER’S LIST – The names of the winners may be posted after August 1st, 2018 at Charbroil.com/70-anniversary and upon written request to the Sponsor. Jarlsberg Burger Giveaway – Win a Big Green Egg! 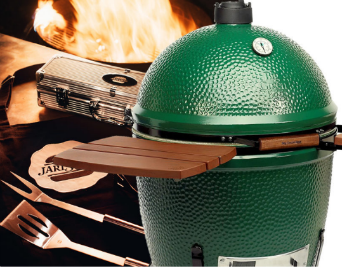 Win a Big Green Egg! ENTER SWEEPSTAKES HERE – Jarlsberg Sweepstakes page. ELIGIBILITY – Jarlsberg® GIVEAWAY or “Sweepstakes” is void where prohibited and open to residents of 49 states and Washington D.C. Residents of Rhode Island, Puerto Rico and any overseas military installation are not eligible. You must be 21 years of age as of the contest start date. SWEEPSTAKES ENTRY PERIOD – Sweepstakes begins July 2nd, 2018 at 10:00 a.m. ET and September 2nd, 2018 at 11:59 p.m. ET. Saputo Cheese USA Inc. Frigo® Al Fresco Instant Win Game and Sweepstakes – Win a gas grill & more! Win an outdoor dining set, a gas grill and outdoor dinnerware! ENTER SWEEPSTAKES HERE – Frigo Sweepstakes page. ENTRY LIMIT – one (1) Game Play and one (1) Entry per person per e-mail and/or mailing address per day during the Entry Period. ELIGIBILITY – Promotion is open to all legal US residents physically residing in the 50 United States and District of Columbia who are 18 years of age or older, as of the date of entry, and have reached the age of majority in the state of residence. 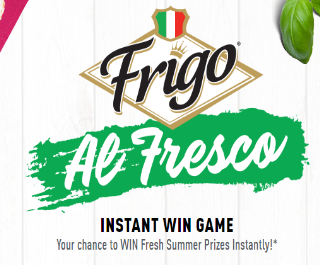 SWEEPSTAKES ENTRY PERIOD – The Saputo Cheese USA Inc. Frigo® Al Fresco Instant Win Game and Sweepstakes starts at 12:00:01 PM Eastern Time (“ET”) on June 1, 2018, and ends at 11:59:59 PM ET on August 31, 2018. PRIZES – One (1) Sweepstakes grand prize winner (“Sweepstakes Grand Prize Winner”) will receive one (1) outdoor dining set, one (1) gas grill, and one (1) 16-piece set of outdoor dinnerware (style, size, and design of items determined by Sponsor in its sole discretion) (“Sweepstakes Grand Prize”). There is one (1) Sweepstakes Grand Prize available in this Promotion. The approximate retail value (“ARV”) of the Sweepstakes Grand Prize is $1,200. Two hundred seventy-five (275) Instant Win Game winners (“Instant Win Game Winners”) will receive a 16-piece set of outdoor dinnerware (style and design determined by Sponsor in its sole discretion) (“Instant Win Prize”). The ARV of each of Instant Win Prize is $50. 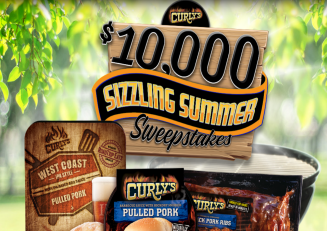 Curly’s $10,000 Sizzling Summer Sweepstakes – Win $10,000! ENTER SWEEPSTAKES HERE – Curly’s Sweepstakes page. ENTRY LIMIT – Limit: One (1) Entry per person during the Sweepstakes Period regardless of whether entrant has more than one email address. ELIGIBILITY – Curly’s $10,000 Sizzling Summer Sweepstakes is open to legal residents of the 48 contiguous United States, plus the District of Columbia, age 18 or older at the time of entry. SWEEPSTAKES ENTRY PERIOD – Curly’s $10,000 Sizzling Summer Sweepstakes begins at 12:00:01 AM Eastern Time (“ET”) on Monday, April 16, 2018 and ends at 11:59:59 PM ET on Sunday, June 10, 2018. PRIZES – Grand Prize: One (1) Grand Prize is available to be won. Grand Prize is one (1) $10,000 check that will be awarded in the name of the confirmed winner. Grand Prize winner will have the option, in winner’s discretion, to use the funds, in whole or in part, toward travel to winner’s destination of choice. Sponsor is not responsible for how winner uses the funds or for any expenses in excess of the prize amount. The ARV of the Grand Prize is: $10,000.00. 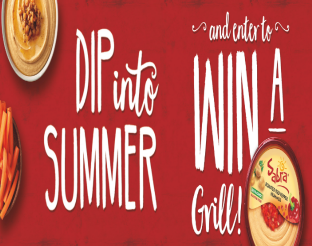 Sabra Summer Grilled Sweepstakes – Win a grill & more! Win a Dyna-Glo Grill, Grill Cover & Utensil Set! ENTER SWEEPSTAKES HERE – Sabra Sweepstakes page. ENTRY LIMIT – Limit: One (1) entry per person over the Sweepstakes Period. ELIGIBILITY – This Sweepstakes is open only to legal residents of the fifty (50) United States and the District of Columbia (“U.S.”) who are at least eighteen (18) years old (excluding Puerto Rico, U.S. Virgin Islands and Guam) at the time of entry. SWEEPSTAKES ENTRY PERIOD – The Summer Grilled Sweepstakes begins on Saturday, June 10, 2017 at 12:01:00 a.m. Eastern Daylight Time (“EDT”) and ends at 11:59:59 p.m. EDT on Friday, July 21, 2017 at 11:59:59 p.m.
PRIZES – One (1) Grand Prize: Dyna-Glo Grill, Grill Cover & Utensil Set (Some assembly required). Approximate retail value of this prize package $300. Three (3) First Prizes: Each winner to receive a $100 Wal-Mart Gift Card. Terms and conditions of the Gift Card apply. Approximate retail value of each card $100. 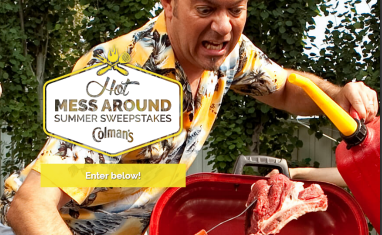 Colman’s Mustard “Hot Mess Around Summer” Sweepstakes – Win $2,500 backyard makeover package! Win a $2,500 backyard makeover package! ENTER SWEEPSTAKES HERE – Colman Sweepstakes page. ENTRY LIMIT – There is a limit of one (1) entry per email address each day. ELIGIBILITY – Colman’s Mustard “Hot Mess Around Summer” is open only to legal residents of the 50 United States and D.C. 18 years of age or older as of May 23, 2017. SWEEPSTAKES ENTRY PERIOD – Sweepstakes runs between 2 pm Eastern Standard Time (“EST”) on June 7, 2017 and 2 pm EST on August 3, 2017. PRIZES – Weekly Prizes: A total of forty (40) weekly prizes will be awarded during the Sweepstakes Period. The weekly prizes are one (1) Colman’s branded t-shirt, one (1) Colman’s branded apron, and one (1) Colman’s branded Squeezy. The AVR of each weekly prize pack is $25.00. The Total AVR of all Weekly Prizes is $1,000. Grand Prize: one (1) Grand Prize will be awarded during the Sweepstakes Period. The Grand Prize is one (1) Backyard Makeover Package (not to exceed $2,500 in value) which includes: one (1) Patio Set, one (1) Grill, and one (1) Décor and Accessories package. The Grand Prize also includes: one (1) Colman’s branded apron, two (2) Colman’s branded t-shirts, and one (1) Colman’s branded Squeezy. Total AVR of the grand prize is $2,535.00.